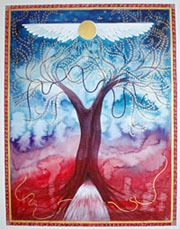 The newsletter and Facebook banners feature the work of a different artist for each Worldwide Womb Blessing. These women come to me, to us, they transmit their message, their wisdom, their knowledge, their experience, their power, their brilliance… They accompany us, they reveal, they awaken what we bear within ourselves. They remind us our connection with the great All and with Mother Earth. I paint instinctively, I follow my intuition, I let the colors and patterns come to me, I am only the tool. I paint on copper foil surface because I love its light that illuminates those women and provide them with respect, sacred and majesty. I let myself be guided. When I paint, I listen to shamanic drumming, Mongolian overtone singing, Amerindian Native songs, mantras… And I listen to my heart. "I am inspired to create artwork that portrays empowered women celebrating their menstruation. I hope to help the current movement in raising the state of the womb and menstruation back to what I believe is its rightful place of reverence and honour in society. Originally from New Zealand, I am an artist who wants to encourage women to be able to deeply honour the cycles of their bodies and inherent womb wisdom through the artworks I create. I want to help raise the state of the womb and menstruation back to its rightful place of reverence and honour in society with my images. My desire is to show what I personally consider to be the inherent beauty, power and sacredness of menstruation. I hope that if more women consciously embrace their menstruation and honour their cyclical natures, a new society may be formed anew, from a more balanced fabric that honours the cyclical: Mother Nature within and without." I was born in Veneto, but I live near Milan since I was little; forgetting for a long time what I really wanted to do I tried to do other things, and then regain possession of my wishes: since then, I paint and lead art therapy and creative expression workshops. 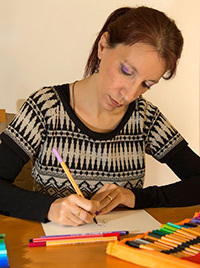 As an artist I am self-taught, as an art therapist I graduated at the Training Center in Arts Therapies of Lecco, then I specialized with a Master at the School of Art Therapy in Milan. In time I added my job with walls decoration and creating handcrafted jewelry, that I like to think as small pictures to be taken with us. My research revolves around the theme of feminine and tree, the blossom, the cyclical nature, the light and the dark and their constant merging: from seed to bud, from ground to sky, I'm interested in everything that lives and regenerates in a constant cycle of rebirth, mistery and splendor. I’m interested, therefore, in Life. As art-therapist I lead paths in different areas; my passion rests on courses dedicated to Feminine and its sacred dimension. I really like use art supporting women in personal and spiritual growth, helping them to re-contact their creativity and authenticity, to discover their gifts and to bring them to the world. The workshops that I lead are a meeting between art and ritual, and they are imbued of everything interests me: the Divine Feminine and mythology, poetry hidden in the folds of the life, body and womb’s listening, views, herbal teas and chocolate. Annick de Souzenelle’s research, poetry by Mariangela Gualtieri, the words of Clarissa Pinkola Estes, the meeting astonishment, climbing, the people’s authenticity, life that continues to regenerate, La Que Sabe. The God of Small and Large, Things. For the May 2016 Womb Blessing, we were delighted to feature the work of Italian artist Mathilda Stillday. 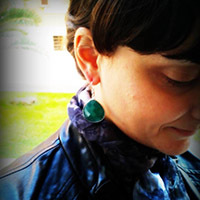 Silvia Ancordi (aka Mathilda Stillday) is a holistic and spiritual trainer. She’s a blogger and writer of spirituals stories. She lives near Rome. 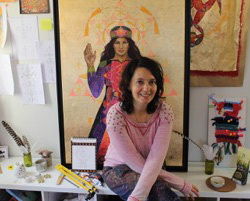 Her doodles, mandalas, goddess and other drawings are the result of her meditation moments. Her spiritual vision is focused on helping women to become conscious about their intuition, feminine power and divine energy. Through her drawings and stories she moves the energies to help finding a balance with divine and feminine centre. 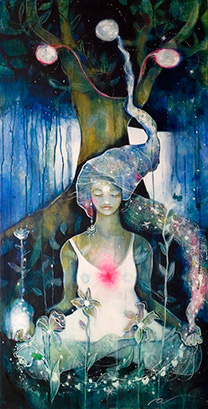 For the first Womb Blessing of 2016 on 22nd February, the beautiful artwork was from Moon Mother Mariela Gómez Cuello. My mother used to scold me because I’d scribble or draw all the armchairs, chairs and walls. I think that was how I started to draw and paint. With time, I got a degree to teach drawing and painting, and kept on drawing and painting… Until one day in 1998, when I moved to Buenos Aires, and then signed up at the workshop of my favorite artist, Juan Doffo in 2002. He was the ultimate Master, he taught me how to shout with my soul, speak through my canvases, listen to the language of color and express myself through emotions. During my last year of studies, I was lucky enough to get a grant to further my career even more. I got to showcase my art in several places, large and small. I then interrupted my studies, but I kept on painting and selling my pieces through interior designers, and I have also catered art pieces upon request. When I got certified as a Moon Mother by Miranda Gray, I received a new voice for my pictorial language and throughout a 3-year period, I created the Moon Oracle, Alunadas. And that voice in my works is the art of drawing and painting. With music, meditations, herb scents, I start to paint, rooted in the Mother Earth’s energy, connected to Her womb, my womb. In the sounds of my brushes colors and images are blended, in creation, my passionate heart full of Love and set onto this sacred task, and my intuition completely attuned with the purity and grace of the Moon Goddess. For the December 2015 Worldwide Womb Blessing, to celebrate the 'Circle of Sisters' we are using the artwork from two artists, both of them Advanced Moon Mothers. Chantal de Souza (Alias SHANTY) is a self-taught artist who started painting in 2010. In love with colours, energies, femininity, spirituality, she explores and combines freely these themes across her paintings. Her creations are singular, vibrant and inspired. - a practice conducive to patience, humility, openness, accepting, discovering, embracing. She is also a Master of usui reiki and an Advanced Moon Mother. "The divine feminine inspires my creations, both drawing and a dance performance . This is the way I have chosen to give voice to the Goddess .."
Advanced Moon Mother, Tribal Fusion bellydancer and teacher, artistic director of the Blåkulla Tribe and president of holistic association Gebo Onlus. 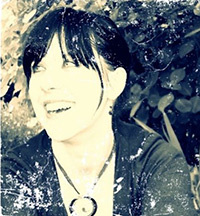 Artisan, designer and illustrator, she is inspired by the female consciousness and spiritual transformation experiences. Practice Reiki, yoga and divination. In Rome she is one of the coordinators of "Progetto Tenda Rossa" (Red Tent Project) since 2013 and she has made ​​the illustrations and graphics of the calendar "Il Tempo Sacro delle Donne" (The Sacred Time of Women). 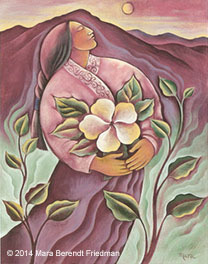 The artwork for the October 2015 Worldwide Womb Blessing is from Chilean artist Sonia Koch. Sonia was born in Arica, and she spent her childhood between paint brushes, colors and books, thanks to her mother who was an artist and her father a lawyer passionate about reading. Her love for drawing and painting grew in a natural and spontaneous way day by day, becoming the axis and the main driving of her life. When she was 18 years old she moved to Santiago to study Design at the Catholic University of Santiago and got a Design degree. For 4 years she worked as a textile designer but after all her passion for art become stronger and she decided to do what she always wanted to do: painting every day! Now she’s developing her work every day at her atelier-home, where she’s constantly looking for new images, colours and textures through her pencils and brushes, fabrics and papers, trying to capture the elements of her own internal world, feelings and emotions. Her creative process is very intuitive and she finds her inspirations in her inner regard: love, motherhood, her womanhood, Nature and her own place within Her, her need for expressing the trascendence of the spirit beyond the physical. Colour is basic in her language: as Nature is multicolored so in her work she has the need to translate that vitality throughcolour in an intense and bright way. August 2015 features the work of Advanced Moon Mother Julia Larotonda (Juliaro). The dance of the Moon and the cycles of life are her inspiration. 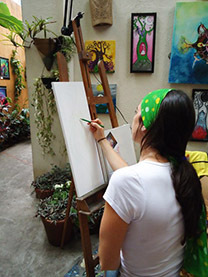 Her art focuses on the reconnection of nature with the sacred feminine. Her favourite theme is women, their cycles and archetypes, the Moon, trees, ancient symbols of the Divine Feminine, Goddesses from different cultures, and menstrual blood. The magic, the unseen, the shadows and the light. Life, death and rebirthing. 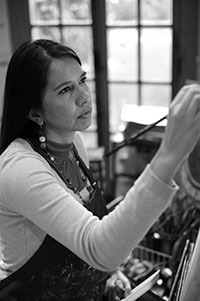 She works with different techniques and materials: acrylic, watercolor, pastel, menstrual art and others. Every year she produces a calendar called “ Woman from Earth” with a selection of her best works of the year. She has also produced moon diaries and other related products. 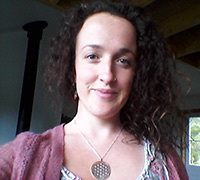 As a holistic therapist she guides women’s circles and since 2012 has been offering a workshop on feminine self knowledge: “My cycles, my phases and the Moon” using texts, arts, dance and healing meditation, relating women with their menstrual cycle and with the moon phases. Nowadays she lives between João Pessoa and São Paulo, Brasil where she works as an illustrator, designer and painter. 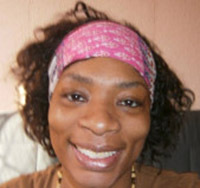 There she offers her workshop " My cycles, my phases and the Moon” as well as Womb Blessings and Womb Healing sessions. 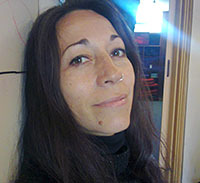 The artist for May 2015was Agnès Mateu. Agnès's work is inspired by the idea that the Womb is a magic, sacred space for art and creation. She has been active on a number of different fronts, from art-making to yoga for pregnant women, in an attempt to contribute to women's well-being and spiritual growth. The Womb is the place from which her commitment to create beauty sprang. Agnès's paintings feed our body, nurture our soul, and enrich the world we live in. A flow of art that comes from the Great Matrix from which we all rebirth at each and every new life cycle. For February 2015 the beautiful feminine artwork was contributed by Mara Friedman. 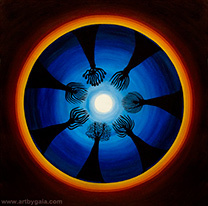 Mara's spiritual vision creates art that not only empowers, but sustains the soul. Her paintings depicting the grace, beauty and strength of women, have been used by many community service organizations as a visual inspiration for their clients. For over twenty years, she has been creating paintings that celebrate and honor the Feminine aspect of Spirit. Her imagery draws inspiration from cultures around the world, from the cycle of the seasons and from universal symbols and form. December 2014 featured the haunting artwork of Gaia Orion, originally from Paris but now living in Ontario, Canada. 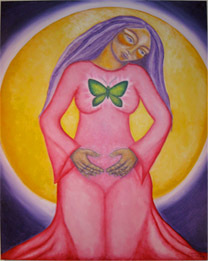 For August 2014's Blessing we had the beautiful work of Canadian artist Christina Smith, whose 'Goddess Wisdom' images in particular have huge resonance with the Womb Blessing. Christina also contributed her inspiration and her magical talent to the Womb Blessing family by illustrating our October newsletters with her art and by creating this artwork "Sacred Womb" especially for the next worldwide Womb Blessing. We can feel in this image a deep, intimate and quiet connection to our Womb Tree and to our authentic Femininity. See http://earthlyimages.ca/ for more of Christina's work!